Last night I got to catch a screening for The Incredible Burt Wonderstone courtesy of Warner Brothers. I've actually never heard of the film before I got the invitation, so I watched the trailer on Youtube. The main plot is that of an aging magician and his partner having to reignite their passion for what they do when challenged by a new magician. The cast for the movie is star studded with Steve Carell as the magician Burt Wonderstone and Steve Buscemi as his partner Anton Marvelton. Their young rival is Jim Carrey playing the role of Steve Grey. To round up the cast, the beautiful Olivia Wilde plays the magician's assistant. All four plays their role superbly. Jim Carrey's character Steve Grey is the type of magician that is similar to Crisis Angel where his acts can often be harmful to the body. This was the typical Jim Carrey role when he was younger and I can't imagine another playing the role as perfect. I am big fans of both Steve Carell and Steve Buscemi and they also don't disappoint. There were at least three moments in the movie where I laughed so hard I thought I was gonna passed out! Not that the movie is without its flaws. For one thing I would've changed was the title. Sure it's unique but it's not something that's easily remembered given it's length. Perhaps that's the new norm now for Steve Carell's movie given his recent "Seeking a Friend for the End of the World." Another flaw is that for all its big laughs, there are a few moments that are just flat. For example, Burt and Anton's peers scene at the bar. The deliveries and dialogue by actors Michael Herbig and Jay Mohr are forgettable. As well, more because of Steve Carell's character being relatively stand offish and dull. There are scenes with his character that you wish can just past by quicker. And finally, James Gandolfini as a casino owner just seems off. His character bordered on the goofy side which is hard to picture him as I still remember the powerful imposing Tony Soprano. Given everything that I mentioned though, go see the movie! It's out March 15th and is the best comedy I've seen in a long while. Most of my friends that are into Facebook or App games are currently playing Candy Crush Saga. The game by Kings.com is available on Facebook, Android and iOS. The game is your basic puzzle game where you must match candies to either clear the screen of jelly, set a certain amount of score or bring down to the bottom of the screen ingredients. While free to download and play, the game charges quite a lot for extras such as power ups and extra lives. The game at times are very frustrating, and probably purposely designed to do so, so that you would be tempted to buy the in-game items. The game as of today is ranked 6th both on Google Play and iTunes. Most of the complaints I've heard of the game is of these purchasable in-game items. The minimum of these items are $0.99 for extra lives or moves. But I've seen some items go for as much as $39.99. With the limitation in place of a total of five lives at any time and the lives regenerating at one life per 30 minutes, you quickly run out of lives. You can get free lives from your friends that play the game via a Facebook request. But the power-ups are not available via this manner. Personally, I've yet to buy an in-game item, never have, and don't ever plan to. The most frustrating level I've faced thus far is Level 65 which took me about a week to complete. In a lot of the levels you're limited by moves and often at times you really need to be LUCKY to have certain candy in place or drop to get those free power-ups necessary to clear a stage. When your lives are full at five, do not accept an additional life from a friend yet. It can't go any higher than five! Instead, wait til your life goes down again and then go back and accept in your messages. In later stages (around lvl 80 - 100) where ingredients are required to drop through the suction, there are some levels with dead spots where the item cannot drop anymore. In those levels always tried to keep the ingredient in the same column where the suction is. In stages where there are chocolate that spreads like a virus. Try to avoid breaking blocks that set them free until you've accumulated a few free power-ups that will help you clear them faster once the chocolate is free. What is common in most of these games, is that always try to work from the bottom up. The reason is that you can often set up chain reactions where moves are precious. Except for timer stages which are infrequent, take your time! Take into consideration how each move can prepare your next move. Overall, I have to say I enjoy this game as frustrating as it may be sometimes. I'm currently on level 104 which took me approximately two to three weeks to get to. Do you play this game? Any tips that I haven't mentioned that you can share? Part two of Season Three is finally upon us as episode 9, The Suicide King airs this Sunday on AMC. Here's a recap of the last episode, in case you've forgotten. Spoilers galore if you haven't seen the last episode! Merle and his brother Daryl are reunited at last but in a fight to the death courtesy of the Governor. Michonne leads Rick and friends on a somewhat successful rescue of Maggie and Glenn. I say somewhat, as Daryl is captured and they suffer the loss of T-Dog. Over at the prison, we were introduced to new characters including a favorite in the comic book Tyreese. Now that you're caught up, here are some of my predictions for the second half of the season. This is of course all speculation, and the TV series haven't really followed the comic book to the letter. So I am not revealing anything that was actually in the comic book. For example, I think both Merle and Daryl do not survive the rest of season 3. I think Merle bites the dust on Sunday, and Daryl shortly after. I think Andrea after seeing the Governor for what he actually is tries to escape with Daryl and that's when Daryl dies sacrificing himself so she escapes. I guess we'll see if I am right soon! More spoilers, this time from the comic book. From the comic book, the Governor is eventually killed by one of his own people. But in the comic book it's the result of Lori being killed by gun fire that it happens. Of course, Lori is already dead, so things will play out a little differently. Also in the comic book, Rick loses his arm to the Governor. I don't see them doing this yet, even if at all. If they're going to have Rick lose a limb, I predict it would be another season due to another villain other than the Governor. Are you a Walking Dead fan? Do you read the comic book? I finally got a chance to see Hansel and Gretel Witch Hunters tonight. I had previously had screening passes to see this. But the screening was on one of those 20 degrees F nights in New York this winter so I passed. The movie is an interesting twist on the classic story of Hansel and Gretel coming upon a cottage made out of candy that has a witch as its owner. Be warned there are spoilers in the next paragraph! Like the classic tale, these Hansel and Gretel also defeated the witch by cooking her in the oven. But this story continues afterwards of when they've grown up. You see, they've used their experience from the first witch to become witch hunters, and they're quite successful at it too. Hansel is played by relatively new action star Jeremy Renner (Avengers, The Bourne Legacy) while Gretel was played by Gemma Arterton (Quantum of Solace, Clash of the Titans). I really enjoyed both of their characters and wish there were a bit more character dialogue from them and character development. I guess the good thing about the movie is that there were a lot of action scenes. The weapons they used was very cool, and the period pieces and costumes was nice as well. The only other issue I would have with the movie is the faith of the white witch. If the box office does well I hope they will make a sequel. They've definitely left it open where it can be a franchise movie with several sequels. As with most 3D movies, was it really necessary to be in 3D? Probably not, but some of the scenes they definitely made good use of it. Have you seen Hansel and Gretel Witch Hunters yet? What did you think? If the above picture creeps you out, than I am insulted. I thought it captured my good side! 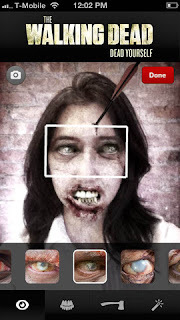 LOL The picture above was created by AMC's new Walking Dead app, aptly named Dead Yourself. In the app, you take a forward facing picture yourself and then dead yourself. You have the options of changing your eyes, mouth, and adding special effects such as a cage or changing the lighting. There's quite a number of options to choose from. Once your photo is completed it'll be saved to your camera roll as well you have the option of putting it on Facebook, Twitter, The Walking Dead gallery or e-mailing it to friends. In the below right pic of my lovely wife, you see that the app is not without flaws. If you notice in the eye area it blends in with the bars of the cell. As well her face size doesn't fit well with the mouth area of this option. Overall, I would still recommend it to everyone. It's still a fun way to pass some time creating dead versions of yourself! What a pleasant surprise last night taking the train home. Along Ditmas Avenue all the way to Avenue N on the F train line I saw a sight I've never seen before. The letters "LTE" on my iPhone 5 screen! Now I have purchased my iPhone pretty much when it first was released which was several months ago. When I first used it, I was dismayed to learn that Sprint had not rolled out 4G LTE to New York City. Instead of defaulting to 4G, instead I have had 3G data service on my phone since. For those of you who have used 3G and 4G there is a HUGE difference. Every month I would search for news of when Sprint would start offering 4G LTE in New York City. The forums had mentioned that 4G LTE was available in some parts of the Bronx since December. But no news on the other parts of New York City. The best I could find was that it should be available possibly by March which wasn't very reassuring! I was seriously pondering whether or not to cancel my contract with Sprint despite still being early in the contract. Do you have a 4G LTE phone? Hopefully you have 4G LTE service! Hopefully, they'll have it around my area of work soon. If you're a fan of Nicholas Sparks, author of such books like the Notebook, A Walk to Remember and The Lucky One, you're in luck. I have one pair of screening passes to give out tomorrow at Noon to his later book turned film, Safe Haven. The movie is not officially out until 2/14/13 but the screening is 2/5/13 at 7pm (must arrive by 6pm) at Kips Bay Theater in New York City. If you're interested in this giveaway, just follow me and comment below which is your favorite Nicholas Sparks book. Safe Haven is a 2013 American romantic thriller film starring Julianne Hough,Josh Duhamel and Cobie Smulders. The arrival of a mysterious young woman named Katie in the small American town of Southport, North Carolina, raises questions about her past. Beautiful yet unassuming, Katie is determined to avoid forming personal ties until a series of events draws her into reluctant relationships. Despite her reservations, Katie slowly begins to let down her guard, putting down roots in the close-knit community. But even as Katie begins to fall in love, she struggles with the dark secret that still haunts her from her past. Eventually, though, Katie realizes that a choice must be made between a life of transient safety and one of riskier rewards, and that in the darkest hour, love is the only true safe haven. I've always wanted to start something like this ever since I've parted ways with RepublicofGeek.com as a writer. Now with a lot of bloggers leaving Luuux unfortunately, I've decided to expand as well. 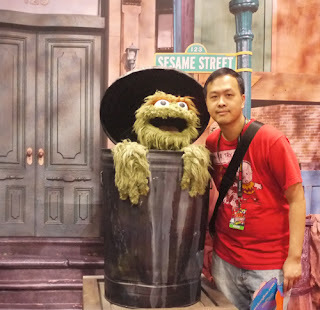 I will still be blogging on Luuux but as the title of my site implies, GeekwithMak will focus more on the geekier side of things such as Movies, Comic Books, Toys, Video Games, Tech and other fun geek related posts. My posts on Luuux will focus more on the other "universes" such as my travels, food, etc. On GeekwithMak, besides fun stories or reviews to share I plan to do a lot of giveaways. I have screening passes to give away for New York City readers as well in the next few days I will have a giveaway for the Godfather Blu Ray Collection (Coppola Restoration)! Anyway, thank you all for reading and hopefully following my site. I really do appreciate your views, comments and such!